It's always a visual delight when couples get married beside Hanalei Bay, Kauai. While working as a Kauai wedding photographer, I've had the pleasure of documenting numerous weddings up and down this gorgeous bay on the north shore. Hanalei Bay weddings are always an amazing experience. 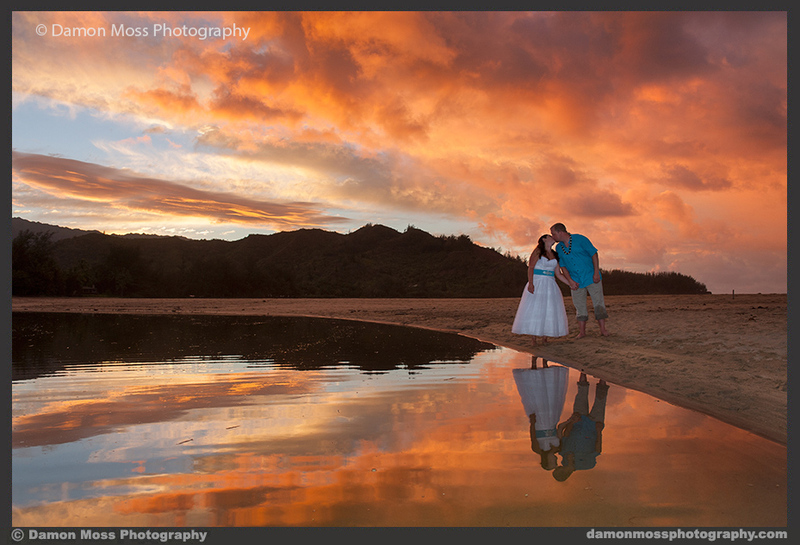 As a Kauai wedding photographer, I regularly see how happy people are when they are married on this beautiful island. Even if it rains, people are visibly grateful and thrilled to experience the dream of being married on a gorgeous tropical beach out in the middle of the Pacific ocean. Kauai has that effect on people's minds and hearts. It will open your senses up and fill you with a great joy that you are alive and survived the winding path of life to see this enchanting place. When I photograph weddings, I always like to take a few shots of dresses and feet in the sand. Along those lines, I liked this recent composition with the colorful bougainvillea flowers amidst the warm sand and beside the tide. Aloha! I always appreciate the opportunity to photograph people in unique settings or circumstances. A majority of the weddings I photograph on Kauai take place on the many beautiful beaches this island offers. Liz and Eric were married at dawn by beautiful Hanalei Bay. And while the bay is a frequent location for weddings, most brides and grooms don't want to get ready in the dark. Watching the sunrise during their wedding was awesome. And then after the ceremony and a bit of celebration with a wonderful catered breakfast for their family and friends, the newly married couple decided to do a little stand-up paddle boarding. I suggested that they take a couple pictures in their wedding attire before they changed and got down to some serious paddling, which led to the fun picture below. Aloha! I've been photographing Kauai for over five years now. When I photographed Doug and Laura's wedding in Kilauea, I had this little hilltop in mind for some post-ceremony portraits of the couple with the Kilauea Lighthouse in the background. I appreciate the way this photograph has a lot of personality, the newly married couple looks great, and the island view behind them is awesome! Sometimes people just love to have their picture taken while they are jumping in the air. It's kind of silly and kind of fun, and I guess those are more than good enough reasons! As a Kauai family photographer, this kind of jumpy behavior surfaces on a fairly regular basis. It's usually a bit "hit and miss" to get a shot where everyone looks good, but this photograph fit the bill. I think there may be a lesson here worth learning about jumping more frequently in pursuit of happiness! I took this photograph of the lovely bride Laura at a recent wedding on Kauai. This image was taken on a tripod by using a "slow shutter" to allow the dance party lights to be photographed. If a photographer just blasts the dance floor with a camera's flash, he or she will lose the ambient lighting (such as the colorful, tent lights) as the flash overpowers them. This slow shutter technique can be a bit hit and miss, but it's fun to do, and always has a kind of artistic, fun quality to it when it works. As a Kauai wedding photographer, the biggest technical challenge is always the weather. It can change so quickly from sunshine to a cloudy day to rain falling to being sunny again, and that's often within 15 minutes! The fluctuating weather keeps me on my toes and frequently adjusting my camera settings. I really liked the light in the photograph below. This is Kate and Jeff enjoying a tender kiss beside Hanalei Bay in the warm, late light. Kauai is definitely an amazing place for Love to bloom. Hope you'll get to experience it too! This photograph was taken after Jessica and Shad's Kauai wedding ceremony near Shipwrecks beach. As weddings are usually pretty fast paced, I don't often have a chance to shoot artistic "slow shutter" wedding pictures of a couple. But these sweet, Kauai newlyweds were happily willing to hold very still for a few extra seconds so I could let the ocean waves blur into a more dreamy seascape while drawing more light and colors from the twilight sky. Thanks for checking out my photography! I've put this new website together to display my work on the beautiful island of Kauai, Hi. Along with the website is a new blog platform where I plan to post recent images and a few meandering thoughts about them. I'm not sure that I want to maintain a highly structured blog with regular updates. Hence the present name, "Blog Sorta," and I'll wait and see how it grows and matures over time. I'd be delighted if you'd check back once in a while to see it as well. Thanks again for visiting!